• Virginia’s Amazing Run To National Title: The complete, in-depth story of how the Cavaliers rebounded from a seventh place finish in the ACC to win its first baseball championship is in this special issue of Collegiate Baseball. • College World Series Notes: Flat-seam ball produces 15 home runs which were a huge improvement over 2013 and 2014 ’Series which only produced 3. • Complete Box Scores of CWS: All 16 games featured in this annual rundown of event. 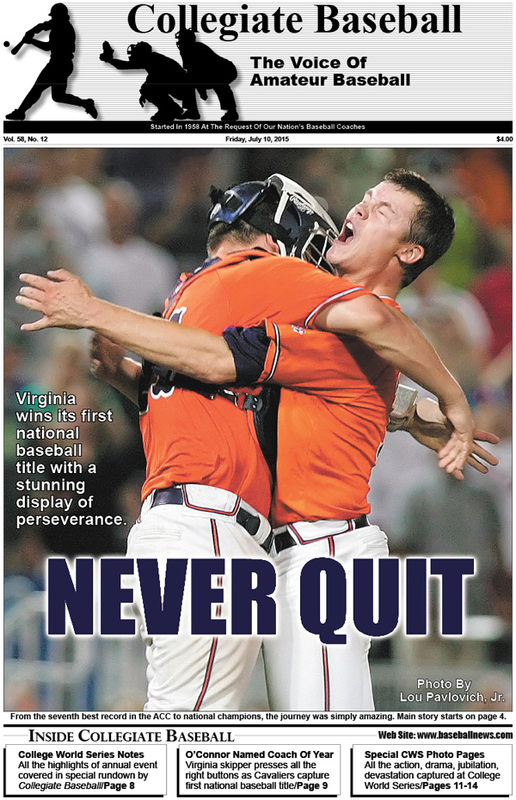 • Exclusive 4-Page Photo Essay: All the emotions, hustle of the College World Series are captured with the photography of Lou Pavlovich, Jr.
• National Coach of The Year: Virginia’s Brian O’Connor never gives up on struggling ball club and leads Cavaliers to national championship. • Anatomy Of A Clutch Hit: Special feature takes a look at how clutch hits are accomplished at the College World Series with in-depth interviews from Virginia hitting coach Kevin McMullan and Vanderbilt hitting coach Travis Jewett. • Collegiate Baseball NCAA Div. I Poll Presented By Big League Chew: Virginia sits at No. 1 after going on amazing run during NCAA tournament. Five of the top six teams in the Collegiate Baseball pre-season poll made it to the College World Series while three other teams that made it to CWS were ranked in the pre-season poll. • Coaching Changes: Numerous moves take place headed by historic hire of Spencer Allen at Northwestern University who became the first black head coach in the Big Ten Conference and just the third black baseball coach ever to lead a Power 5 conference team. • Ruleball With Rich Marazzi: Rich explains what the definition of a legal catch is which will surprise many. • Charlie Greene Column: Garth Iorg explains a better method of covering second base on a steal attempt. • Tom Kovic Column: Summer is an important time for athletes to be recruited as Tom explains why. • ABCA High School All-Americans: Nick Plummer of Brother Rice H.S. (Bloomfield Hills, MI) named National Player of The Year. • NCAA Division I ABCA All-Americans: Vanderbilt SS Dansby Swanson named Player of The Year. • NCAA Division II ABCA All-Americans: Catawba RHP Craig Brooks is named National Player of The Year. • NCAA Division III ABCA All-Americans: SS Sam Dexter of Southern Maine named National Player of The Year. • NAIA ABCA All-Americans: 1B Ty Abbott of Georgia Gwinnett named National Player of The Year. • NJCAA Division I All-Americans: Garrett Benge and Evan Mitchell named NJCAA Division I National Player and Pitcher of The Year. • NJCAA Division II All-Americans: Chris Mattison and Randy Bell chosen NJCAA Division II Player, Pitcher Of Year. • NJCAA Division III All-Americans: T.J. Condon, Jace Vines are named NJCAA Division III Player and Pitcher of The Year. • Pacific Association Division All-Americans: Francis Christy of Palomar Junior College named National Player of The Year. • California Community College All-State, All-Northern and Southern California teams: Amazing athletes named to these teams, including Players of The Year, Hitters of The Year and Coaches of The Year. • Intriguing Research: University of Rochester researchers uncover remarkable information that the human brain tracks the curve ball just like your cell phone’s GPS. Plus, a link to the internet which shows videos of how this happens. • Justin Dehmer Column: Self-reflection is an important tool to help you grow in any area of life. Justin gives list of 21 questions to have your pitchers self-assess so that they can create purposeful practice between now and their next opportunity to pitch. • Brian Cain Column: Mental game to Bryan Kervin was crucial in baseball but probably even more so during serious illness which nearly cost him his life. To purchase the July 10, 2015 edition of Collegiate Baseball, CLICK HERE.